Unfortunately I don’t have the titles (had to return to the library), but a few chapters especially stood out to me: those about the conjoined Hilton twins, Joe Carstairs, Dolly Wilde, and Romaine Brooks. These four felt the meatiest and most engaging—Bergman could expand each of these to its own full-length book and I’d read them. Her prose is at once delicate and lovely but also straightforward. I found it wonderfully different to experience slices of the women’s lives through the eyes of others in proximity to them, rather than being inside their heads (with a few exceptions). The shortest chapters were about 2–5 pages, and only one left an impression on me—the one about the women liberated from the Bergen-Belsen concentration camp. Two stories I really enjoyed but perhaps didn’t quite fit with the collection were about Allegra Byron, illegitimate daughter of Lord Byron, and the updated take on The Lottery by Shirley Jackson. They just didn’t exactly fit, I felt, because Allegra was a child and the Lottery update was pure fiction instead of historical fiction. But they were excellently written and honestly two of my favorites in the collection. 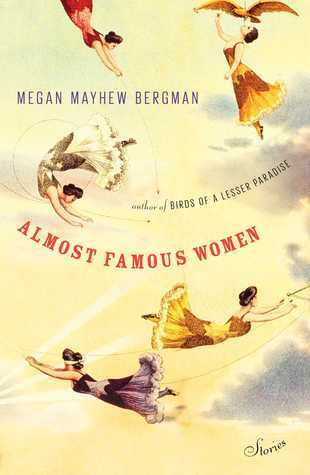 I have struggled with short stories in the past, and still had to try a bit with this (due to external circumstances, I’ve been distracted while reading lately), but Almost Famous Women was one of the more compelling and page-turning collections I’ve read. I think one reason I became so intrigued is because these real-life women were intriguing—I found myself doing a little internet sleuthing on Bergman’s subjects and was fascinated. I don’t think I would have ever randomly discovered these women and their stories on my own without Bergman’s book. Read from March 1 to 12, 2015. This entry was posted in books and tagged drama, female adolescence, fiction, historical fiction, short stories and essays, women by kristin @ my little heart melodies. Bookmark the permalink.